Samsung today announced the Galaxy S8 Active, a rugged version of the S8 that will initially be sold by AT&T. The phone does away with the attractive, curved design of the S8 in favor of a more rugged metal frame with bumpers that are able to withstand drops up to 5 feet. Samsung says the phone meets mil-spec 810G for protection against abuse. The S8 Active offers the same protection from water and dust as the standard S8 thanks to an IP68 rating. The phone carries over the S8's 5.8-inch quad HD+ display with 18.5:9 aspect ratio, but relies on a flat piece of hardened glass. Other features unique to the S8 Active include a larger 4,000mAh battery, and Samsung's Activity Zone software for tracking workouts and other activities. The S8 Active carries over the S8's Snapdragon 835 processor, 12-megapixel main camera, 8-megapixel front camera, and dedicated Bixby key. The Samsung Galaxy S8 Active will be available for preorder from AT&T starting August 11. AT&T is offering a range of promotions and deals along with the S8 Active. It includes discounts on DirecTV service, as well as myriad AT&T apps and services, such as NumberSync, Advanced Calling, Advanced Messaging, and push-to-talk. The phone costs $28.34 per month for 30 months, or about $850. Samsung's Galaxy S8 Active is a rugged version of the company's flagship Android smartphone. If you favor form over function, the Active delivers in spades. Samsung today said its rugged Galaxy S8 Active will soon be sold by T-Mobile and Sprint. The phone has been available from AT&T since earlier this year. Documents seen on the FCC web site suggest the Galaxy S8 Active will be Samsung's first Band 71-compatible smartphone for T-Mobile. 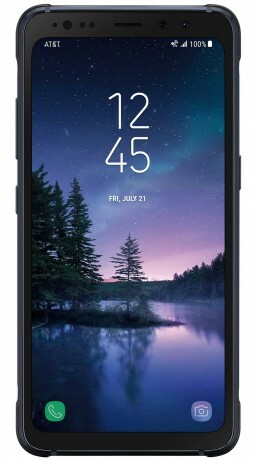 The government agency recently approved a new version of the SM-G892U, already sold as the Galaxy S8 Active by AT&T, this time with Band 66 and Band 71 aboard. The FCC recently approved a Samsung handset that has all the basic markings of an "Active" variant of the Galaxy S8. The SM-G892A supports AT&T's LTE bands, in addition to Bluetooth and WiFi.